In Telerik’s RadRichTextBox you can easily insert images, tables, etc. Now it is possible to label these by inserting captions. This will help you define an image or a table and then refer to it later. You can open the Caption window by clicking on the Caption button. On the top there is a preview of the caption text that would be inserted. In this case we haven’t inserted any other captions with label “Table” so the number that follows is 1. That number represents the number of captions inserted before that one with the same label. You can select different options. The first one is Label. From here you can select the label text. By default you have two options – Figure and Table. We will have this option only if the caret is in a table or on an image. Otherwise it will be disabled. You can add new labels by using the New Label… dialog and of course delete old ones with the Delete Label button. When Exclude label from caption checkbox is checked the label text will be removed and only the number will be left. You can control how the numbering is displayed by using the Format ComboBox. You can see the available formats in the picture below. By default the (“1, 2, 3, …”) format is selected. The first number shows the bullet of the section you are currently in, and the second number shows the number of Captions being inserted in this section. A section is defined by the Heading styles, but only when they are in a list. 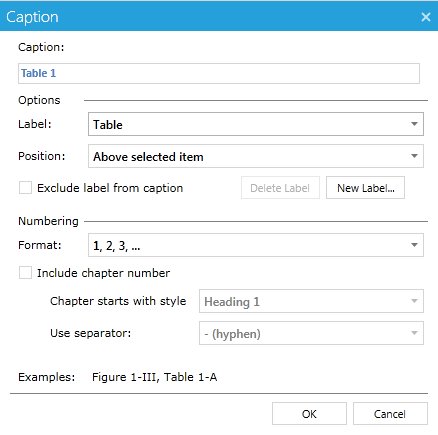 You can choose which Heading style the chapter starts from and what separator to use. There are several available separators – hyphen, period, colon. Here the Below selected item position is chosen, : for separator and A, B, C… for formatting. This code will insert a default caption with label Table.